Comic Book Movie News: Hot New Superhero Movies! Regardless of whether or not you have liked each and every superhero movie, it's certain that there are lots more to come from both Marvel and DC. Ever since Christopher Nolan reshaped Batman and changed the last decade in movies (remember, no one knew Christopher Nolan or the term "re-imagining" in the 90s), every director is shooting for that dark edge. Nowadays, comic book movies at least have the choice to challenge the audience, rather than just rely on one-dimensional good guy, bad guy story arcs like Ghost Rider and Daredevil. As the lights went down for Iron Man 3, at least three trailers popped up showing off the new movies from Marvel and DC. Each one looks intriguing and iconic in their own way, as each tale continues to build from the modern mythology built from Stan Lee, Jack Kirby, Jerry Siegel and Joe Shuster (to name a few). Right on the heels of Batman, David S. Goyer and Christopher Nolan conceived the story for the Man of Steel, much like they did for the Batman trilogy. According to IMDB, "A young journalist is forced to confront his secret extraterrestrial heritage when Earth is invaded by members of his race." Set to launch this June, Superman is portrayed by Henry Cavill, Amy Adams steps in Lois Lane’s shoes, while the great Michael Shannon takes on General Zod. Kevin Costner and Diane Lane are Jonathan and Martha Kent, as Russell Crowe steps up to portray Superman’s biological, alien father, Jor-El. Zack Snyder directs the epic after completing his versions of Dawn of the Dead, 300, and Watchmen. In other news, it's rumored that a movie about the theft of Nicolas Cage's copy of Action Comics #1 is being made! Stepping back into his iconic role, Hugh Jackman straps on the claws once again in The Wolverine. IMDB sets up the movie as, "Wolverine makes a voyage to modern-day Japan, where he encounters an enemy from his past that will impact his future." Recently, the previews seem to say that he will be turning mortal, which could mean the end for the X-Men leader. "Eternity can be a curse," comments his old friend. "The losses you have had to suffer. A man can run out of things to live for," he remarks. Hugh Jackman is Wolverine, Famke Janssen plays Jean Grey, Will Yun Lee portrays Silver Samurai/Kenuichio Harada and Brian Tee is Noburo Mori. 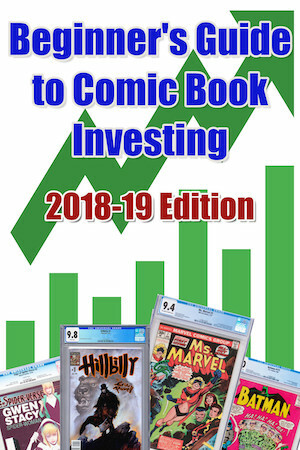 If you have either tried (and failed) to make money flipping comic books, or are frustrated by the huge array of choice out there, then this is the eBook for you. It's packed with 32 in-depth analyses of easy-to-buy and sell comic books from the Bronze to Modern ages. These are titles we have personally made a lot of money buying and selling. So can you. Make more than your money back with your first successful trade (or by NOT buying a losing book!). If you are not completely satisfied, we have a 365-day money-back guarantee. Click to read more, or order your copy today! "When Jane Foster is targeted by the denizens of the dark world of Svartalfheim, Thor sets out on a quest to protect her at all costs," writes IMDB. This time, Thor is directed by Alan Taylor, known for his television work on Game of Thrones, Boardwalk Empire, Bored to Death, Mad Men, and The Sopranos. The screenplay comes from Christopher Yost, known for written work on twelve different television comics, revolving around The Avengers, Hulk, X-Men, Iron Man, and the Teenage Mutant Ninja Turtles. Chris Hemsworth is back in the cape and blonde curls, Natalie Portman plays Jane Foster, Tom Hiddleston is Loki, Idris Elba is Heimdall, Rene Russo is Frigga and Anthony Hopkins is once again Odin. Whether or not you enjoyed the first Thor, this will certainly revolve around the plot of the first Avengers, since Loki is once again being set free, this time given a chance to do good. Insure, Appraise and Sell Comic Books today!